Currently, when a moderator deletes a user all of the user's votes are removed along with the user themselves. I was pretty surprised at this behaviour when I first heard about it, and I don't think it is a good idea to throw away all of the votes just because the user is deleted. Votes are locked after a short while and you can't change your vote unless the post is edited. This is a precedent that shows that users don't have complete control over their old votes, their ability to change or remove their votes is restricted for the benefit of the whole site. I don't understand why users that get deleted are suddenly exempt from this restriction. The drawback of removing the votes is that we throw away valuable information. Voting plays an important role on SE sites, and every time an active user is deleted we throw away some of that information. I also don't see why rage-quitting users get to remove one kind of contribution (votes) while we stop them if they try to remove their other contributions to the site (posts). We stop users from deleting all their posts because they still provide value to the site, I don't see why we shoud treat votes any different. They might have less value than posts, but they are useful to the site as a whole. I'm ignoring any vote invalidation in connection with vote fraud or sock puppeting for the purposes of this post. Those votes should certainly be invalidated, but that doesn't usually happen by deleting users. To prevent abuse of user deletion for vote fraud, there could be some minimum requirements on account age and reputation, below those requirements any votes would be discarded on deletion. Any suspicious voting patterns of the user should automatically block the deletion until they have been checked manually. This is of course more effort for the moderators, but account self-deletion doesn't happen so often that this would be a problem in my opinion. 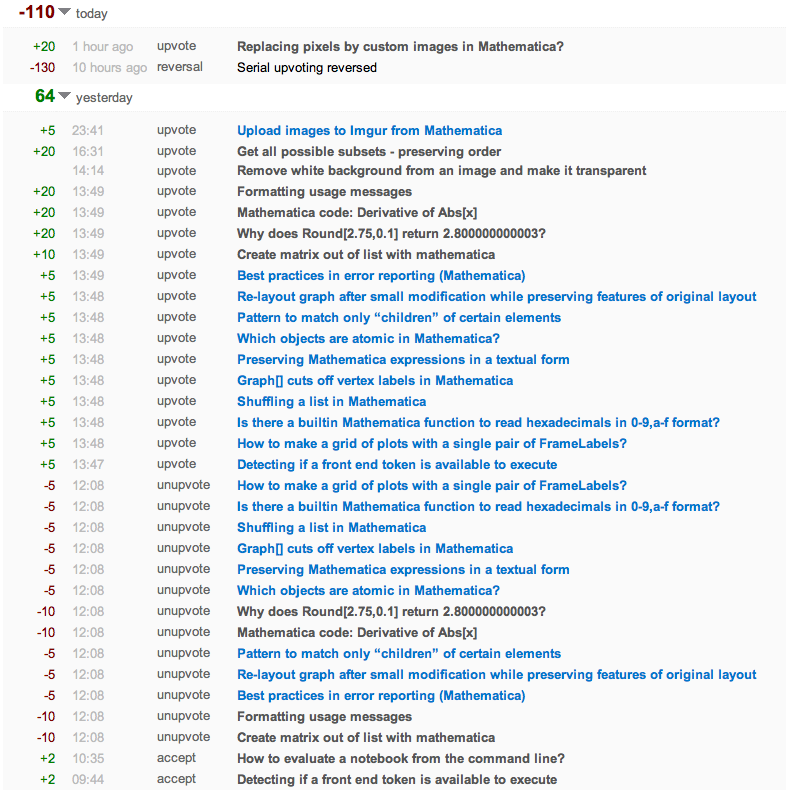 The recent change to counting reputation from deleted questions if they are old enough and have at least three upvotes moves the whole reputation system further into a direction where reputation can't be taken away after some time. The reasoning for this change was that even though certain questions are off-topic now, they used to be on-topic and therefore the reputation earned had some meaning then. This provides further precedent that reputation shouldn't be removed retroactively on a large scale. I'm not gonna call this completed; as you and everyone else reading this know, we do still throw away some votes for some user-deletions... and probably always will for the reasons you noted in your proposal. The exact values of those thresholds don't particularly matter; they're pretty low, but not so low that you could hit them easily while still hiding fraudulent activity. If either threshold is exceeded, deletion is held up until someone reviews it. Otherwise, deletion proceeds and any votes are discarded. If, during review, it becomes apparent that the user is or ever was involved in voting fraud, the votes are discarded as they would normally be. Otherwise, the votes are preserved. Full disclosure... I lost 410 Rep on SO the other day due to a deleted user. I fully agree with the arguments made above. If the deleted votes are the result of an account merge, then it makes total sense to remove them, since double-counting of votes shouldn't be allowed. However, if a user has their account deleted, either from questionable behavior or of their own volition, then their history of voting should remain. Old posts, even if they are considered off-topic now, still have value due to either some still-useful content or as a place-holder to keep old links from breaking. A user who made a helpful contribution at that time shouldn't be penalized when a post is later deemed to not be a good fit for the site. Old votes still clearly have value in that they help to separate good content from bad/mediocre content. The value placed on votes is evident from the fact that there are 7 badges that encourage it (Supporter, Critic, Suffrage, Vox Populi, Civic Duty, Electorate, Sportsmanship). Throwing away votes just because the account of the voter is gone is a loss of useful contributions to the site. A user who made a contribution that was deemed helpful at that time that a vote was cast shouldn't be penalized when the account of the voter is later deleted. The vote was cast at a time when the account was valid, and should stand. Even if an account is deleted because the user began doing spammy, trollish, or otherwise unsavory things, the fact that the deleted user had already earned their voting rights by making enough useful contributions should mean that the votes they cast while in good standing should still remain. I think that it's only fair to treat all contributions to the site in the same way, whether those contributions are questions, answers, or votes being cast. The policies adopted to handle post deletion and maintaining Rep for deleted posts should absolutely be applied to the maintenance of voting histories and the Rep gained from them. I don't want to take a position on this until I see some data. What causes users to get deleted? Are there a lot of respectable users who have had enough, and want to quit voluntarily? 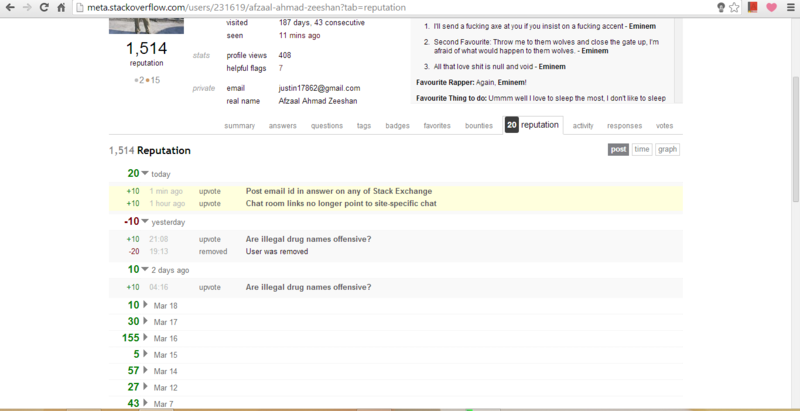 Or are there a lot of spammers? If there are lots of spammers, do many of them vote on questions they post answers to, or do they typically not get enough rep for that before being caught? How about sockpuppets? Vote ring accounts? Tactical downvoters? I would want votes to be kept for quality users who just don't have the time/interest to participate anymore, but not for socks. It's harder to say for spammers; there have been a few discussed on Meta who posted some good content but also posted a lot of links to their own products. And those are just a few examples; I'm sure there are plenty more cases out there. How often do users get deleted? If it's infrequent, we could have mods manually determine which accounts to keep votes for on a case-by-case basis. A one-size-fits-all solution may not be the way to go here. 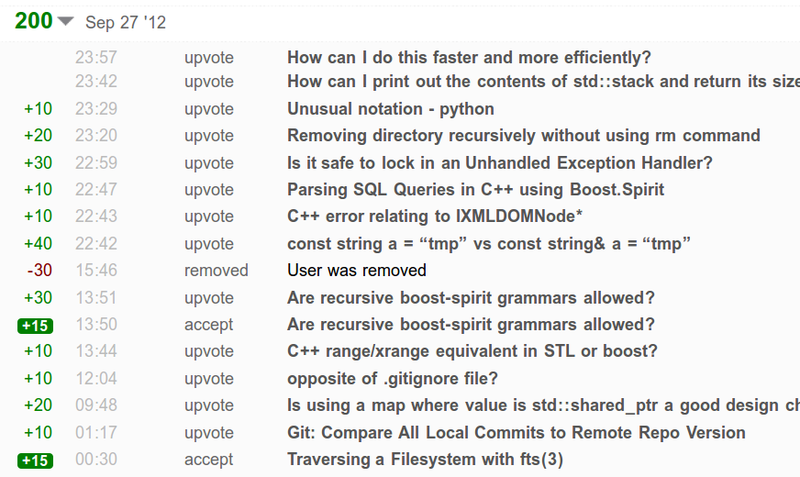 I feel this is unfair to the people that dedicate their time to regularly answering question on StackOverflow. Part of Stack's appeal is that you can get a reputable individual to answer your tough technical question. Without the people performing the work of answering these questions, the site really loses its appeal. Reputation points are rewards for that hard work and dedication to the site. People dedicate their time to making this site popular and appealing. I wake up between 3:00am - 4:00am every day, so I can get at least one hour of answering questions on this site prior to heading off to work. My day always gets off to a bad start when I wake up and see that I lost reputation points because some scumbag has committed voter fraud and unfortunately upvoted an answer I submitted honestly. Think about if our society punished all crimes in this manner. So if an accountant at your work committed a crime, should you be stripped of the paychecks they signed? Punish the people responsible for the inappropriate conduct, not the honest members of this community that dedicate themselves to this site. If you lose reputation points because a user account was deleted, there is currently no way to tell which of your questions or answers were affected. Would it exceed all of the abilities of software technology to change that? After reading through things, it sounds like the moderators should decide when the user "turned bad". Draw that line in the sand and keep votes before it, lose votes after it. I'm notified of end complaints about this on my FAQ answer about the "user was removed" message (some related old comments have been removed). It is clear to me that the behaviour of throwing away all the votes is very counterintuitive to most users, and they become annoyed and frustrated as a result. This is creating a bad user experience. It would have been a convenient hack for easily handling spammers and voting rings in the past, but now Stack Exchange could provide a better solution. The way I see it, removing upvotes cast by a user that is removed is like punishing everybody that he upvoted, regardless of the patent fact that they themselves had nothing to do with his actions that led to his removal. I suggest that upvote rep changes should be locked so they cannot adversely affect us later when the user that cast them gets deleted. Perhaps those upvotes were justly deserved; even the user that abuses his terms of service is not a complete idiot. I think this is a necessary change and really should be implemented as soon as possible. The reputation points is determined by votes. The reputation point is a variable that changes depending on votes. The reputation is a status of a member of this community at a given time. So I think if a member is, in our case deleted from the community, then all his votes should leave with him. Why? Because he is no longer a member of the community and his previous votes shouldn't determine the current status of another community member. It may seem unfair but it is logical. I totally agree with @kmb385 in his answer: https://meta.stackexchange.com/a/164209/234982. I just want to go little further - keep reputation for edit as well. When I see ugly formatted question / answer, I clean it first so it is possible to understand it. And sometimes I receive small reputation for it. That is fair. But it happens that user is deleted. Then all my work is lost. My work disappears. It is disgusting when somebody voids your work. And even my reputation is decreased. So this is the second penalization. I realized that I do not have any will to fix the questions from beginners or that were downvoted. Why shall I spend several minutes of my life doing some work that somebody can erase? Please keep the reputation of deleted users please. There is no reason to punish the people that were helping them. That is unfair. There seem to be two separate issues (a) sometimes a user is deleted because their behavior has been unacceptable; (b) sometimes a user has been abusing voting. I don't think it's good policy to conflate the two. If a user has abused voting then as far as possible those votes should be reversed immediately whether or not their account is to be deleted. To a large extent this is already the case. On the other hand, if a user account is deleted, their votes should remain - because their non-abusing votes matter, and their abusive votes should already have been removed. At most, where a user's votes are deemed to be be largely abusive at removal time (and perhaps part of the reason for their account deletion), then there's an argument for removing both the user and all their votes together. That would require an option to delete the votes rather than automatic deletion. Outside of that possibility, account deletion and vote removal should be separate issues. I have been through this just yesterday. But it was just 20 rep, so it doesn't matter. As you have already mentioned, the user that has upvoted gets his vote locked after sometime and cannot remove his vote, until the post is editted! The restriction for the upvotes must be kept for the removed accounts too. The upvotes are earnings and should not be removed, they are more likely the contributions of the people to the community. However, if there is something fishy about the account, such as serial upvoting etc, then the user must be removed and the upvotes must be undid. Similarly, ban must be put on the account and all the same legal (Stack Exchange Law) restrictions! It's a tad unfair on the good users who help the sites/other users by voting and answering, only to be punished for other users bad actions, or their wanting to close their account. 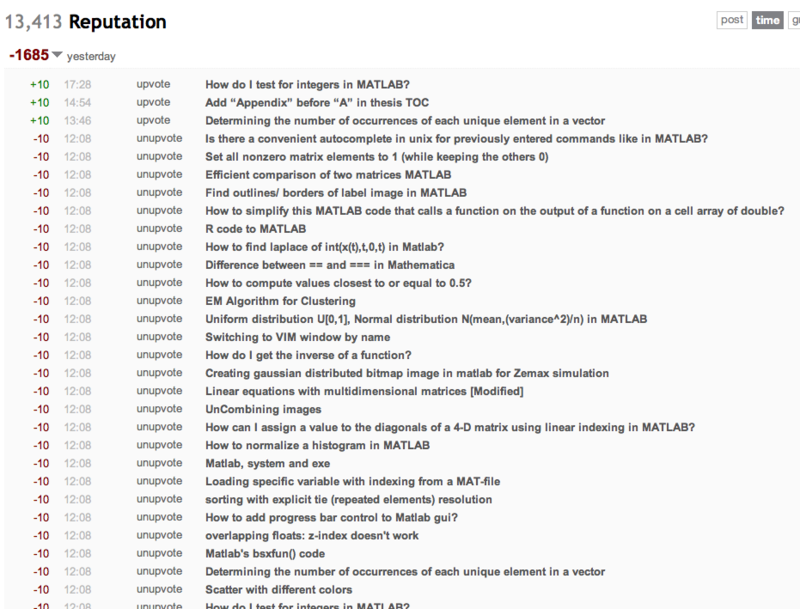 Answering is a major part of what the basis of the Stack sites are about - Q&A. So to simply remove users' hard work just because another user wants out, or did something bad, is simply not fair. Voting is also one of the main elements of the Stack system. It determines good and bad content and allows separation of the two, to allow decent content to be served more prominently. Thus making the sites as a whole better. "Making the internet a better place.."
It's unfair on the community who help the sites and users by their good actions of answering and even those just voting the answers, to then lose the benefits gained from their actions when those very actions are encouraged and promoted by the site in the first place. It's also unfair that good users performing positive activity lose their benefits through negative activity from the very users they were spending their time helping in the first place. It shouldn't be possible for our positive activity and time spent to be revoked by the very people we're trying to help. Even if not by negative activity, the point still stands that users have contributed and shouldn't have the time they spent, for free, helping others and the Stack sites simply forsaken. Of course it all boils down to one being protective of ones assets. We are awarded for voting and answering, we feel a part of the community by answering, and downvoting that terrible answer, or upvoting a great one. So we then feel greatly put out when our time spent, the benefits or even simply progress towards a benefit, is lost due to another user performing bad action or wanting their account removed. The site should protect those decent users contributing in a way that without it the sites would degrade rapidly. The other side to this is why should we gain, or progress towards, benefits from votes on a (now) non-existent question or answer? Is rep you gained or lost from deleted content a real representation of activity you have carried out which benefits the site? Both arguments exist and are equally valid. We used our time, performed positive actions, did what we're asked and encouraged to do at the time the content was present. 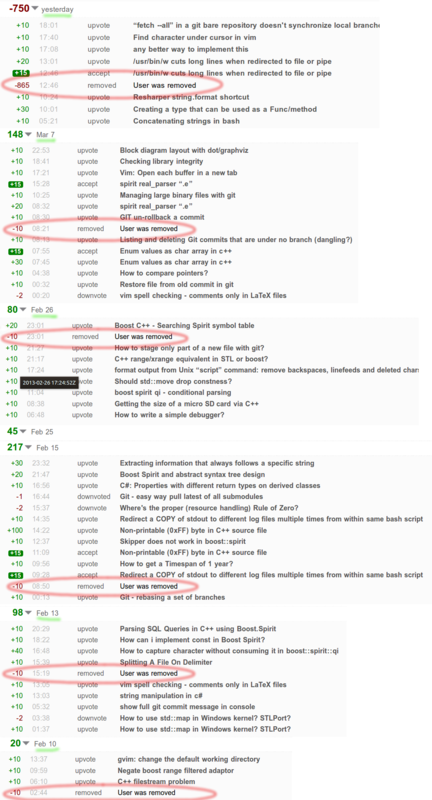 So, while I see the argument for removing votes from deleted questions, and agree with the reasons to some extent, I do not in any way think this argument carries enough weight to allow bad user activity to counter our hard work, positive activity, and working to ensure the site remains high standard. Users helping the site and it's users out have no way of knowing a question might be deleted by the user or a clean up, so we should not be punished for performing the positive and encouraged activity at the time the question was live and when our actions are welcomed by the site. As is often the case, there is likely no perfect resolve. I don't really know enough about the system or when one loses votes etc to propose a decent and well structured resolve. However, there are suggestions around which would make it a bit more fair on the decent users. Mainly a change so users don't always lose all their decent activity. I think it would be fair that any rep (votes up or down, bounty, accepted, etc) received on answers is not lost when the OP user is deleted and their questions removed. Obviously, any downvotes on answers must also remain in order to keep a balance of what was present at the time of the question being live. However, there must also be a way for users to still delete their answer from the deleted question if they wished, whether up or downvoted. As changing as it is now from revoking all votes as if the question never existed, to keeping the votes present, stops users from being able to pop back and remove their answer when they realise it had X downvotes. This would need to be catered for somehow. Again, I don't have the answers, but it is an issue that good users lose their rep, reward progress, and sometimes actually losing privileges, from other users' bad behaviour and it should certainly be addressed. Lastly, slight side step to the topic, I don't see why all content is removed. Is this a rights thing whereby the OP is allowed to have their question removed? If so, I think it should be changed so, while the OP can be unlinked from the content, the question and answers should be left in place. This would resolve the issue of rep lost and leave the question live and normal play continues (up/down votes, users removing their answers etc). The question could simply be taken over by a dedicated Stack account - "deletedUserAccount" or whatever. Not the answer you're looking for? Browse other questions tagged feature-request status-deferred voting users deleted-accounts . “User was removed” means I lose my hard-earned points? User was removed … Ok, why am I getting punished for it? How to hide negative reputation in the reputation history? User was removed - Why does it affect me? When a user account is deleted, what decides when to preserve and remove the votes of the user?